A native of western Massachusetts who made Dorchester his home for more than three decades, Mr. Wheelwright, 68 at his death, was active in civic life and in promoting Dorchester as a welcoming place for artists who, like him, found inspiration both in the diversity of the neighborhood’s people and in its often-undervalued natural beauty. He was instrumental in the creation of the Humphrey Street Studios, which has been one of Dorchester’s most important gathering places for artists over the last half-century. 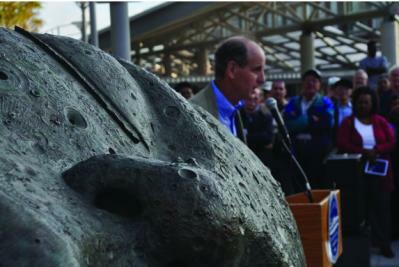 When Joe was commissioned to create what would become the “Sleeping Moon” on the north plaza of Ashmont Station, he was inspired to create a “good companion” for the historic clock that sits yards away — across Ashmont Street. “The moon, the original timepiece, seemed a good companion to the much-loved iron clock in Peabody Square,” Mr. Wheelwright told the Reporter before its dedication. “‘Sleeping Moon” floats close to the ground atop a 16-inch mirrored post, as if resting during the day, almost quivering in anticipation of ‘re-launching’ itself into the heavens at nightfall. Its light green patina surface with black and gold details is alive with craters, mountains, and rivers, inviting viewers to examine the details on all sides. “I’m honored to have a major public sculpture in the Dorchester neighborhood my family has enjoyed for almost 30 years,” Mr. Wheelwright told us. Sleeping Moon in mourning shroud: The signature sculpture outside Ashmont will remain covered until Oct. 15.News of Joe’s death last week stunned many of his neighbors, most of whom were unaware of the grave nature of his illness. He was buried in a private service in Vermont and now his Dorchester friends and admirers are planning their own tribute to their neighbor. Greater Ashmont Main Streets, together with Joe’s brother, propose to drape the “Sleeping Moon” sculpture in a mourning cloth for a period of ten days. The plan is to remove the drape on Sat., Oct. 15, at 9 a.m. at a gathering with Joe’s loved ones, including his wife Susan. A second memorial service for Joe Wheelwright is being planned for the larger community in the fall. Information about that service will be posted soon on his website, joewheelwright.com.